Ed Note: Bad news is The Times-Picayune ran the despicable cartoon you see above. Good news is the community is outraged and cops are getting a lot of support. Below you will find emails of all the principals who were responsible for printing this outrage. Let them hear from you loud and clear. The following was sent to us by Mike Glasser, president of the Police Association of New Orleans, and a captain with the New Orleans P.D. Mike can be reached at: glassermd@aol.com. 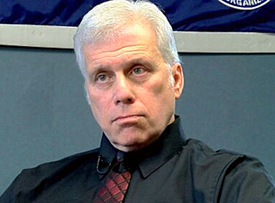 Mike Glasser is president of the Police Association of New Orleans and a captain with the New Orleans P.D. We Need Your Help With This! Citizens, cops, social experts and politicians are struggling to find a way for the police to ensure safety, guarantee that constitutionally protected rights are not infringed upon, and show that commitment to the public to assure confidence. 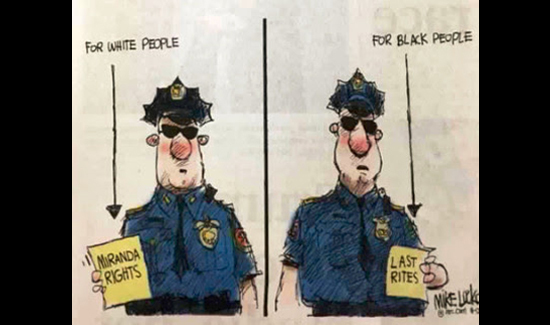 The Times-Picayune staff chose to completely undermine those efforts by posting this repugnant cartoon. The media too often rarely lets the facts get in the way of a story that will sell newspapers, get ratings or visits on line. Today the media has a lower approval rating from the public than Congress. When did it become fashionable to hoist thugs onto a pedestal . . . thugs with lengthy criminal histories coupled with armed violent actions against both the public and the police? The good news is that the community has been very supportive and many prominent members of the business community have pulled their ads from the newspaper. But we need to do more. Please help us. Below is a list of the people involved along with their emails. Please contact them and let them know what you think about this cartoon. And thanks in advance for your help. You can read more about this on my Facebook page.